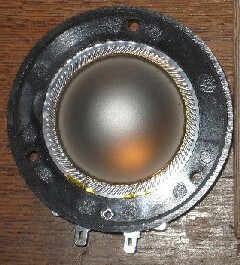 On the internet you will find many vendors that offer replacement diaphragms for your tweeters. Generally there is a distinction between the 'original diaphragm' and the 'aftermarket diaphragms’. Even though the word 'original' might seem seeclear and unambiguous, it is not. Sometimes a manufacturer will buy from another manufacturer and just stick their brand sticker on it. Is this one still original? Anyway, these original diaphragms are of good to very good quality and pretty durable if treated the righ way. They are unfortunately sold at very high prices (through dealers). The titanium dome is replaced with aluminum, the copper-plated aluminum coil is replaced by an aluminum coil, flat wire (ribbon) coil is replaced by a round wire coil etc. For the avarege customer, these differences are difficult to see, especially on a vague/small picture offered on the web. We have seen many, many diaphragms and have more experience to see the difference. By the use of another coil, the coil will be thicker or thinner so that the coil might rub the magnet or the efficiency of the unit decreases. 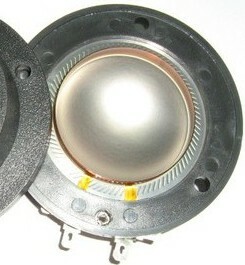 Sometimes the holes in the diaphragm are just not positioned correctly, a problem common in aftermarket JBL diaphragms. As a result, the diaphragms is very difficult to place. Most aftermarket are produced in the Far East (China, Taiwan, Thailand, Japan) and then transprted to Europe or the USA. A small aperture damage makes it unusable al. Only well-packaged diaphragms survive the journey to your front door. In general, the quality of the packaging with the price. In recent years we have gained much experience with diaphragms and we keep gaining experience visiting speaker producers. After visiting a number of factories in the countries mentioned and testing a large number of samples, we came to our current range. We guarantee that your diaphragm will fit, will work according to the specifications and were manufactured using the materials promised. Our diaphragms are perhaps not the cheapest aftermarket diaphragms that you can find, you might see cheaper ones elsewhere, but we guarantee you this quality for a lower price will be very hard (if not impossible) to find. Although the photos are not of too good quality, there are clear differences we can see. Our advice: orient yourself well gefore you buy your diaphragm. - An instructional video for the JBL EON15 and 2418 is available here. - An instructional video for Electro-Voice DH3, 2010, Eliminator, etc. here. - An instructional video for Foster / Fostex, Yamaha, etc here. - An instructional video for Mackie here. If your diaphragm is not listed above, simply look at a search engine or search on youtube. Replacing diaphragms is a standard procedure, so we recommend you to watch one or two of the above videos so you get the picture.